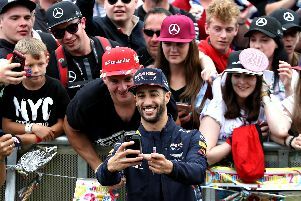 Lewis Hamilton praised his own pit-stop calls as he completed a hat-trick of home victories by winning an entertaining British Grand Prix at Silverstone. The reigning world champion recovered from another poor start to seal a 38th career win and remain on course to equal his hero Ayrton Senna’s haul of three championships. Looking at the usual suspects on the Silverstone podium it would look as though this was another obvious, boring race with the main protagonists again dominating with consummate ease. But this 52-lap corker was proof that Formula One is alive and kicking with periods of rain, an impressive supporting act from Williams and a couple of first-lap shunts. Hamilton timed both of his pit-stops perfectly, firstly leap-frogging the fast-starting Williams pair of Felipe Massa and Valtteri Bottas - who had jumped the Mercedes duo from the start - and then putting on the intermediate tyres as the heaviest of the rain came, thus placating a push from team-mate Nico Rosberg. “The race was very very tough,” said Hamilton. “It was very slippery off the start but it made it more exciting when I was chasing down the Williams and it was very hard to get close and overtake. Mercedes chief Toto Wolff, who was shown on television theatrically punching the air as Hamilton sealed the win, also hailed his driver’s decision making. “It was Lewis’ call to come in,” he said. Championship leader Hamilton has won here twice in the past, both of which came in his previous title-winning seasons, and he moved 17 points clear of Rosberg - who spent a large part of the race stuck in fourth place. Ferrari had endured a poor weekend but Sebastian Vettel somehow found himself on the final podium step, beating the Williams after the plethora of late pit-stops as the changeable weather created late drama. After pit-stop woe in Monaco cost Hamilton a race win, this was an example of just how to do it - and he was delighted to win in front of his adoring home crowd again. In contrast, Jenson Button’s afternoon was over within a minute - he had very little chance of picking up his first-ever Silverstone podium but the McLaren man would have still been bitterly disappointed to not even make it half-way through the opening lap. The 2009 world champion was hit by team-mate Fernando Alonso as the Spaniard avoided an incident involving the two Lotus cars of Pastor Maldonado and Romain Grosjean. Alonso at least managed to take his first point of the season as he brought his car home 10th, his first finish in four races and only McLaren’s second points finish of a dismal year. Button said: “He lost the rear and was trying to escape an incident and doing so obviously his front has come around. Hamilton had started on pole, his eighth of the year, but both he and Rosberg were bogged down on the start and were overtaken by the marauding Williams of Massa and Bottas. Button, Maldonado and Grosjean all retired and the safety car was required - with Massa still at the head of the field. Hamilton was all over his gearbox at the restart but pushed too hard as the safety car peeled in, locking up and running wide to allow Bottas back into second place. It was all change at the pit-stops as Hamilton was the first of the leading quartet to pit at the end of lap 19, with Massa and Rosberg following on the next lap. The under-cut worked for Hamilton and he was easily ahead when Bottas came in on lap 22 - with Massa able to stay ahead of his team-mate and Rosberg still at the back of the leading train. There was a looming threat of rain as ever-blackening clouds gathered over the Northamptonshire countryside and it arrived shortly after the virtual safety car had been deployed. None of the front-runners came in for intermediate tyres but Bottas was struggling and Rosberg eased past into third. He then caught and passed the second Williams of Massa to move up to second place and set off down the road after title rival Hamilton, making up almost two seconds a lap before Hamilton came in with eight laps remaining to change to the intermediates. It proved to be the perfect decision as the rain began to fall much heavier, with Rosberg struggling on his dry tyres as any late battle for the lead failed to materialise - leaving Hamilton to secure a fifth win of 2015.